Our Little Weed Friends Invade! Tags: Our Little Weed Friends Invade! As part of our seeding process, we plant a little extra seed to overcome potential germination problems which can include, planting too deep or shallow, poor seed germination percentage, soil crusting, insect and animal issues, diseases, etc. When extra seed is planted, if we achieve full germination of almost all the seed, our planting will become overcrowded and the extra seedlings will become “Weeds” competing for water and nutrients. To remedy this, we thin the seedlings to the correct number. Usually the seed packet will indicate what the proper spacing should be. We usually do this in two or three stages. 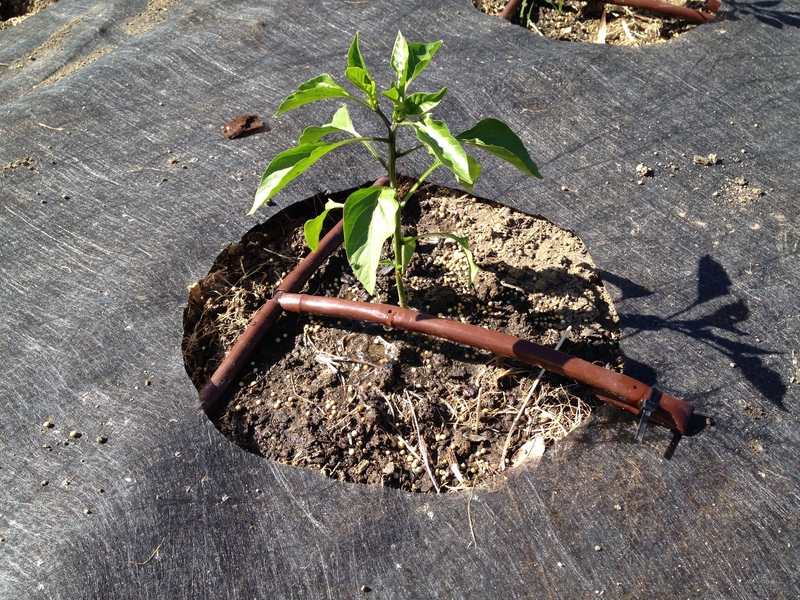 The first stage is to eliminate deformed or damaged seedlings. 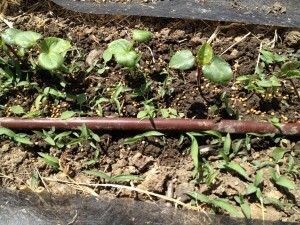 The second stage is to thin out healthy seedlings which are just too close together. Sometimes we do this over a couple of weeks so we can evaluate which are the strongest growing plants, in the best position, within either a “hill” or row. When we are done thinning, the planting should have the correct spacing to allow for proper light penetration, water availability and access to nutrients, for the time when the plant is mature and fruiting. The Garden is Growing! 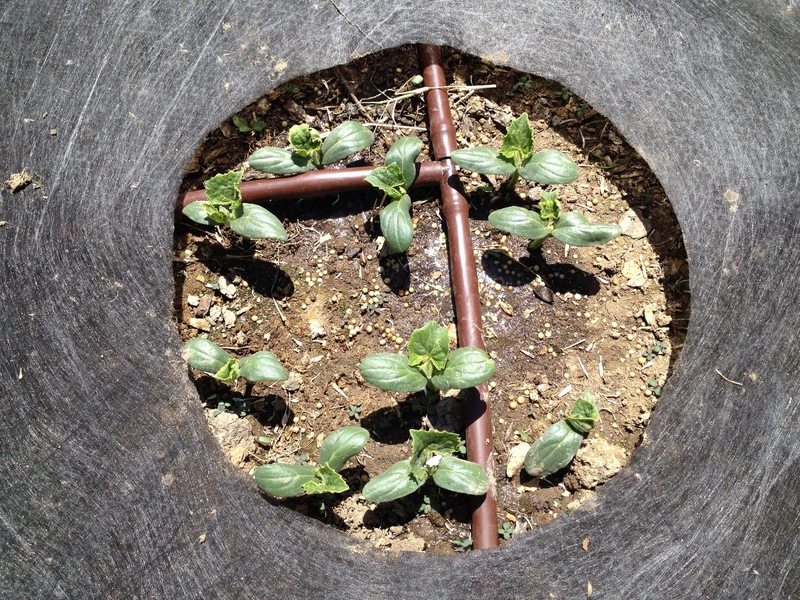 All of the seeds we have planted are up and growing except the Ping Tung Long Eggplant. It is exciting to see the germinating seeds push up through the soil, open the cotyledons, and then form the first primary leaves. Most of the seeds germinate on their own quite nicely, but sometimes beans and especially lima beans, need a little help. Many times with lima beans the hypocotyl (the stem between the soil and the two cotyledons) will break off if the soil is not loose enough to allow it to pull up and out of the soil. When this happens the seedling will die. 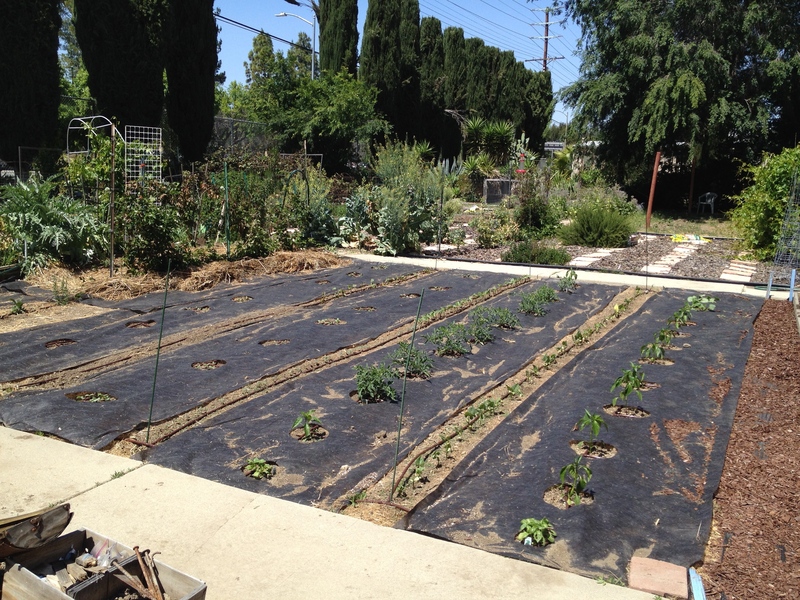 In a home garden, if you make sure the soil surface is kept moist, this will help greatly. We usually sprinkle a little water on the row every other day while the seeds are germinating, just to keep the soil surface moist. There still may be a few seedlings that still need extra help. You can help the seedlings further by putting your finger down in the moist soil and removing the soil obstruction, so the hypocotyl is free to extend upwards. At the same time our seeds are germinating, the tomato, and pepper transplants are growing upwards and outwards and are adding new leaves and stems. Some blooms are also forming, some of which we are removing to help the plants focus on vegetative growth rather than fruit production. By delaying fruit production our plants will develop a stronger structure to support future fruit production. Tags: The Garden is Growing! 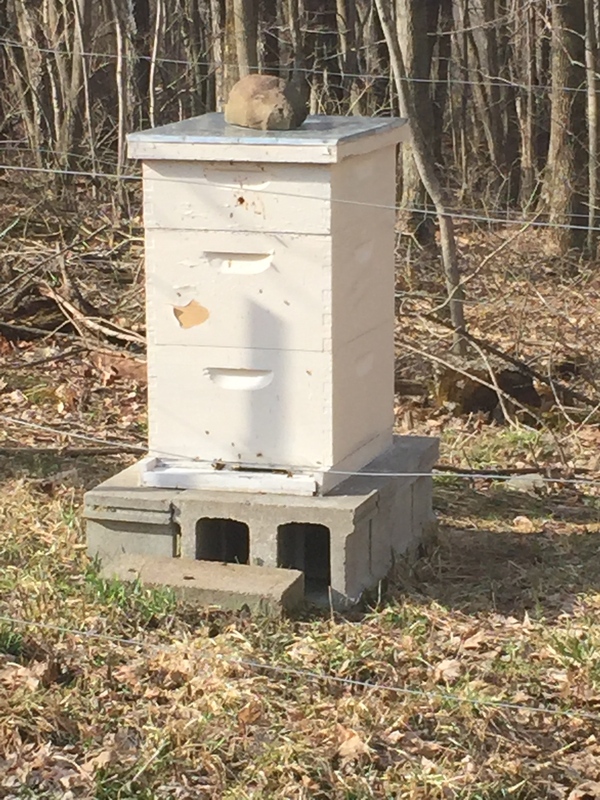 Honey Bee Colonies Survive Over Winter! Our neighbor walked up to evaluate the Honey Bee Hives (Colonies) a day or two ago. We have very good neighbors!! What she observed, surprised us! 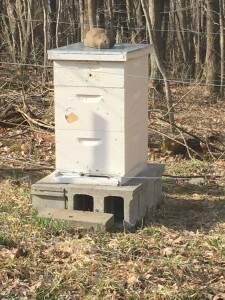 We had three Honey Bee Hives overwintering in western New York State, which she observed all showed activity indicating that they have survived an unusually cold snowy winter. The previous two winters we had lost all our hives over the winter. We made some changes last spring and summer in the way we attended to our Honey Bees. First we changed our package bee supplier to a local beekeeper who has been successful in overwintering his colonies. We are now using a Carniolan Honey Bee which is native to the southern portion of the Austrian Alps in Europe. These bees overwinter as smaller clusters and increase colony size rapidly in the spring after the first pollen becomes available. They also have a tendency to be active gathering pollen and nectar in cooler temperatures, like those in western NY. We are hoping the Carniolan Honey Bees also have some resistance to infestations of mites which currently is the biggest enemy of the Honey Bee. The second thing we did was treat for mites in mid summer to reduce the population of mites in our hives. We believe this will help with the overall health of the colonies and help them overwinter successfully. We will check the Honey bees, in person, in May. Hopefully they will be buzzing happily!! Honey Bee Colonies Survive Overwinter! Tags: Honey Bee Colonies Survive Over Winter! Yearling Whitetail Deer After a Long Winter! It has been a long, cold, snowy, winter in western New York State in 2014/15. It has only been about 10 days since the temperatures have started to remain above freezing for more than 24 hours. We wouldn’t be surprised if there isn’t still a few drifts of snow in shady spots that have yet to completely melt. In the spring when this happens the deer will now have broken away from their winter herding groups and dispersed into small groups or as individuals, and many times will return to their old home geography. They are hungry and looking for something nourishing to eat. Wildlife food plots which contain perennial forages like Imperial Imperial Whitetail Clover and Imperial Whitetail Chicory immediately begin to regrow and offer a high protein forage on which these deer will feed. Wild Turkeys will also be attracted to the clover. Planting these types of food plots will help the deer regain their nutritional health after the winter and help the Does especially, since they will be giving birth to a fawn or fawns, in a month or two. Sometimes wildlife food plots are perceived as simply a “bait” to lure deer into position so they can be shot during deer season. This is a misconception, since wildlife food plots contribute to the overall health of the deer throughout most of the year and in some climates all year long. 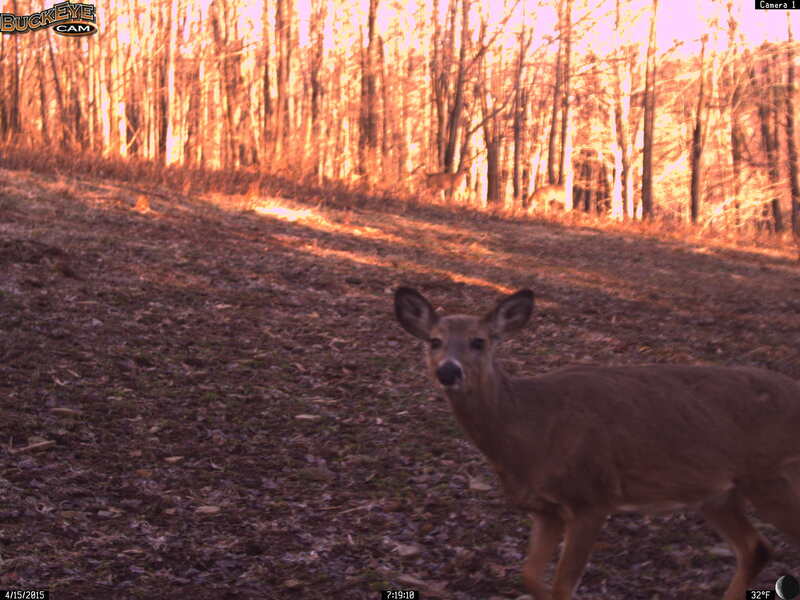 Many more deer will feed and benefit from food plots during the course of a year than the few deer that will be harvested during the hunting season. 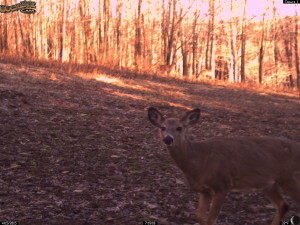 Tags: Yearling Whitetail Deer After a Long Winter! Planting Beans – Utilizing Space! Planting Beans – Utilizing Space! Since we only have a limited area to plant we want to take advantage of all the space we have and also manage weeds. A good rule to follow is that full canopy of growing plants is one of the best ways to out-compete weeds. In turf, we would say a lush healthy lawn is the best way to control weeds. This is true of gardens, as well. In our case, we are planting a row of beans in the approximately 1 ft. of space between our fabric strips. We have three such narrow spaces to plant. In these spaces, we are planting a full row of Fordhook 242 Lima Beans, a half row of Trilogy Snap Beans (a combination of Purple, Yellow, & Green), a half row of Okra (Burgundy Purple & Clemson Spineless), a half row of a Korean Sweet Potatoes and a half row of Yukon Gold Potatoes. Our fertilization stategy is to make a surface application of Osmocote fertilizer combined with periodic applications of Miracle Gro fertilizer diluted with water and applied over the rows. Osmocote is a slow release fertilizer which releases nutrients over about 90 days depending on temperature and moisture conditions. Miracle Gro contains plant nutrients that are immediately available to the plant and also contains secondary and micronutrients that are necessary for plant growth. The combination of the two fertilizers should get the plants off to good start and reduce the need for future applications while they grow, flower, and produce beans, tubers, and pods. Tags: Planting Beans - Utilizing Space! Help Germination – Add Fabric Squares! 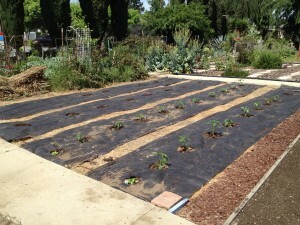 We direct seeded some seedless watermelons and eggplant outside in field conditions. Both seed packets contained instructions requiring a warm seedbed for proper germination. Both suggested that we should start these seeds in a greenhouse setting, but not having these conditions, we gambled and planted them outside anyway. The soil was warm at the time of planting but old mother nature fooled us once again (It was near April Fools Day!) and listed a cool forecast for about 10 days. What to do? We cut landscape fabric squares, and placed them over the germinating seed, using landscape staples to hold them down in the wind. 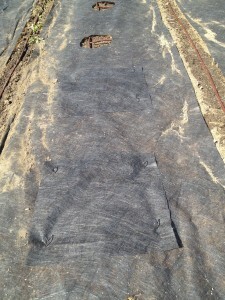 This is a medium to light weight fabric that allows both some light and rain to penetrate. We concluded that this fabric would allow air and moisture movement but that the temperatures under the fabric would be increased during the day and moderated at night. Most importantly the soil temperature would be held moderately warm through the entire cool period. This is exactly what happened. The watermelon seed has germinated and the jury is still out on the eggplants, which is a very small seed. We also used this technique on some cucumbers which worked great!! We will remove the fabric tomorrow when the daily highs return to the upper 70′s and the daily lows rise back into the 50′s. Tags: Help Germination - Add Fabric Squares! We started planting the garden with transplants including Peppers (Red Bell, Green Bell, Jalapeño, Hot Hungarian Wax, and Sweet Banana), Tomatoes (Juliet Grape, German Johnson, Yellow, several big red tomatoes like Beefmaster, Big Beef, etc. ), Herbs (Rosemary, Basil, Oregano, Thyme, Chives and Sage). Then we planted some Cucurbit seeds starting with Slicing Cucumbers (Stonewall, Marketmore, and Talledega), Picking Cucumbers (Excelsior and Jackson Classic), Seeded Watermelon Sangria and Seedless Watermelon Gypsy, Squash Grey Zucchini and Squash Yellow Early Prolific Straightneck and Cantaloupe (Halona, Athena). Fall Planted Pansies & Tulips! 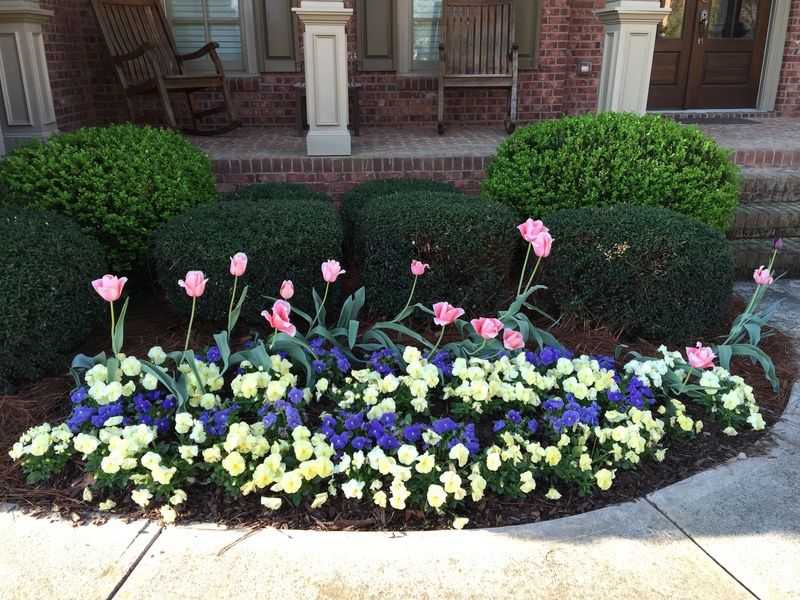 Fall planted Pansies and & Tulips really dazzle in Georgia in April. These pansies were planted about the first of October. The addition of some slow release fertilizer to the soil at planting will help promote flowering during the remainder of the fall, winter, and spring. 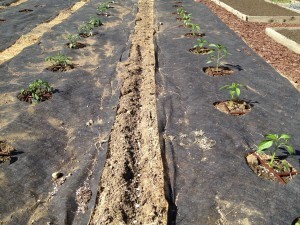 The addition of a mulch material in between the plants after planting will reduce potential weed infestations. When picking the bedding plant flats at the nursery try to pick the most fully grown, well rooted and healthy plants you can find. 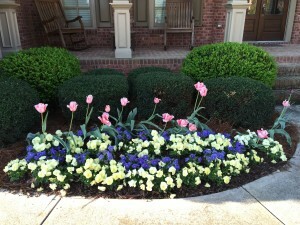 We will let these bloom until late May or early June and then we will replace them with a summer bedding plants. 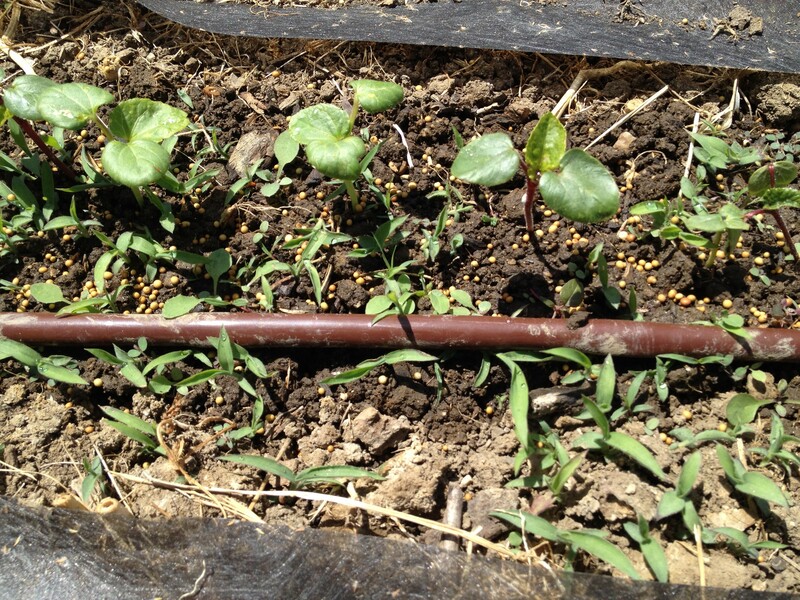 When using trickle irrigation drip tube, sometimes there will be plants that need more water than other plants along the line. One simple way to do this is to add a “T” coupling and a short line with extra emitters. The end of the tube can be bent back and strapped in place to create a “plug” at the end of the line. 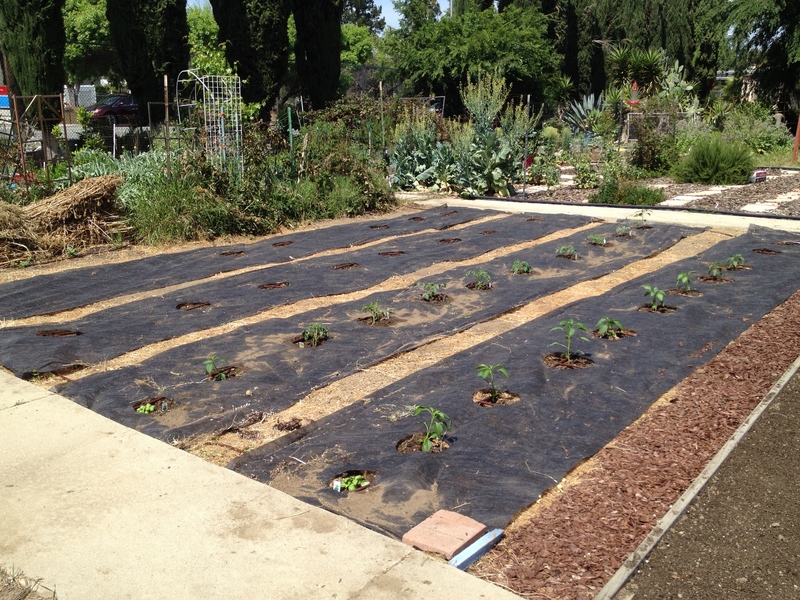 If planting and setting up the irrigation at the same time, seeds or plant(s) can be placed next to the emitters for more efficient watering, using a shorter watering time and saving water.